Most businesses know they have to measure and review their activities periodically. Usually this is undertaken every month. And it is usually the case that the larger the business the more formal the review will be. However, whether the review is informal, formal or something in-between, the most common mistake all businesses make is to measure the wrong things. Ask any business person what their most important business metric is and the answer will almost certainly be Profit. This will be followed by Revenue and in the same breath Costs. Straight away the overall tone of the review has been set: 1. It is financially oriented and 2. It is measuring things that cannot be changed (that is, things that have taken place in the past). The review of these things can tell us nothing about what we should be doing; they simply tells us what we have done. Any metrics we put in place must have a meaning. Obviously it is not wrong to measure Profit, Revenue and Cost, but we have to ensure there is a context within which we look at these metrics. This is where the Balanced Scorecard comes in. It sets a context through a formal structure and review process. Firstly, it sets the scene for a full range of metrics that can be applied to the whole business through the use of ‘Perspectives’. There are four perspectives; 1. Financial, 2. Customer, 3. Internal Processes and 4. Capacity, Learning and Growth. Within the four Perspectives, business objectives and corresponding metrics can be set. This builds a picture of the business, both present and future, paving the way for a decent set of review metrics. Secondly, it is based on the principle that if you are going to measure something, then there must be a reason, which is a business objective. If a business objective is put in place, this more readily drives the need to select measures that will influence change (for the better). For example, when measuring safety on a production line, you could measure the number of accidents per month. Over time, this will give you a view as to how safe the production line is, but it will not help you make the production line any safer. If you added the measure; the number of people trained in safety procedures, then you have created a measure that you can influence (by more or less training). Using a combination of both measures creates a ‘safety index’. 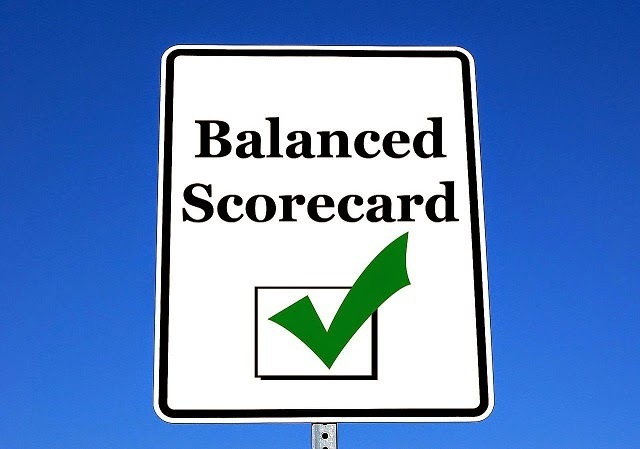 Managing a Balanced Scorecard can become a complex activity. There may be multiple metrics linked to each other and to objectives that are contained within perspectives all of which may result in connected initiatives. This is where decent balanced scorecard software solution can be a real help. QuickScore is one such solution. It is the only software formally recommended by the Balanced Scorecard Institute and is available from Intrafocus based in the United Kingdom. If you want to measure your whole business and improve what you are doing, going down the Balanced Scorecard route is one solution that really should be looked into.